BATTLEGRAVE show their groovy Thrash Metal onslaught with pride, giving the listener huge chunks of fairly original Thrash Metal to chew on. The compositions of “Pt. I: The Witch in the Wood” and “Pt. II: The Flames That Lick Your Flesh” are heavy and unpredictable. The music delves into unique passages that show Thrash Metal successfully combined with atmosphere, and the heaviness and atmosphere intertwine to make chaotic riffs. These chaotic and atmospheric riffs are also seen on “The Emerald Cave”, a slower, chuggier song that focuses more on heaviness than on speed and technicality. There are good riffs all over thus album, especially on “Swallowed by the Wave (The Wreck of the Trinculo),” a song that also revitalizes a lot of old school Thrash Metal themes. “The Gavel Says… Die!” starts the album off with plenty of heavy riffs and thrashy rhythms to give one whiplash. “Relics of a Dead Earth” is another old school Thrash Metal rehash, but this time it’s done correctly. 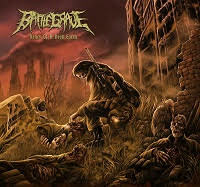 With a lot of technical riffs and heavy compositions, BATTLEGRAVE made a great debut for themselves. The musicianship and execution are both top notch. If you like modern thrash like HAVOK, then this is for you. If you like the riffage of BIO-CANCER, but are turned off by Lefteris’ vocals, then this is also for you. 1. The Gavel Says… Die!